Rodents, especially rats and squirrels, are quite common in Toronto and its surrounding areas. But while the squirrels look pretty and cute when out in the wild, you definitely do not want them anywhere near your home. Unfortunately, if you live in Toronto then it is probably just a matter of time before some rodents of one type or the other eventually invade your home. 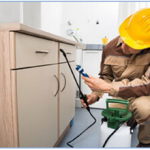 It helps to always be prepared for such an eventuality so that you are in a position to deal with the rodent problem if and when it should arise. Here are some tips that can help you do that. As they say, prevention is always better than cure and the same applies when it comes to rodent control in Toronto. There are many ways to prevent rodents from invading your home, the most effective one being taking away their food source. The main reason why rats and mice might want to invade your home in the first place is in order to look for food. If you take precautions not to leave anything that they can eat lying around then they will not have a reason to come. The best way to do this is by ensuring that you maintain a clean environment both in and around your house and make sure that all garbage is properly disposed and covered. Most Toronto pest control companies might also advise the use of special traps placed at strategic locations to capture the rodents before they invade your home. So you might want to consult a company that conducts rat control in Toronto and squirrel removal in Toronto for advice on the best way to prevent these rodents from finding their way in.